Joys of Caravanning - Germany page 3. Rheincamping Meerbusch, Zur Rheinfahre 21, D-40688 / Nordrhein-Westfalen. Email :-info@rheincamping.de Website:-Here ACSI Camping Card not taken in 2015. This campsite was very pleasant indeed with grass pitches all along the Rhein River. Owners very pleasant and helpful indeed. There was an Outside Bar which looked inviting. TV via Satellite 80 cms Dish was good. Toilets, Showers etc., These were all portable buildings as is the reception due to being so near the river it can flood in the winter. All were modern and very clean. There was a very nice Hotel on the approach road to the site which served nice meals. Adjacent to the campsite was a car/passenger ferry to cross the river to visit Dusseldorf or Essen. Cannot tell you what there is to see in the area as we were there two nights to meet up with some German friends who live in Essen. When they came to visit it was in the 30's so warm and they arrived with their dog by foot on the Ferry. Photo of Site and Ferry. HESSEN Area of Germany. The Rhine Valley. HERE ARE THREE CAMPSITES ALONG THE RHINE. Geisenheim am Rhein, Am Campingplatz 1. 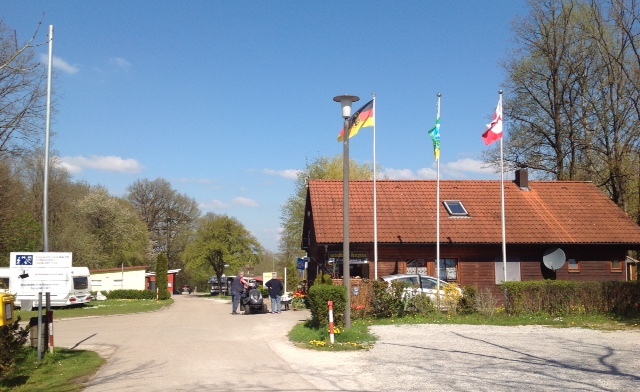 Email:- campingplatzgeisenheim@t-online.de Website:-Here ACSI Camping Card Site No. 628 in 2013 Book. Though I am telling you about this site we have only ever visited it tosee whatit is like and it does look very nice right on the banks of the Rhine. It is situated a few miles just outside Rudesheim. Camping zur Bruckenshanke, Hattenheim, Eltville. Website:-Here Owners Famille Philipp. This campsite was recommended to us by German friends who we have met their three times. It is a pleasant little site right on the banks of the river with un-interrupted view of the river. The family also own the Gastof situated just before the site. This is where you have to stop and check in and you will be given a key, on deposit, for the gate to the campsite. The Showers and Toilets are quite basic but very clean. Some hard standings along the river front, EHU and Water very close by. No Train noise here but barges are on the go all day and a few at night. These have never disturbed us during the night though. I suggest you go to our various trips of 2006, 2007,2008 and 2010 when we have visited this campsite you will see more about the area. Camping Lorelyblick St Goar. Website:- Here. This site is situated opposite the Lorely is a very pleasant site which stretches along the bank of the Rhine, there is a railway running along the back of the site but the noise from that and the river boats did not worry us but may some. Toilets and showers were excellent as was the service in the reception. More on this campsite in our 2009 Trip Site No. 8. Photo of site from the Lorely high up on opposite side of river. Tauber Idyll, Camping, Rothenburg/Detwang and is situated just outside the walls of the town in the tiny village of Detwang Website:- Here and listed in www.eurocampings.co.uk and Caravan Europe Book 2. The site is small and quiet. The owners will take you to a pitch and get you settled in there. Showers, Toilets and Laundry are excellent and we could not fault anything. For more details of this campsite and Rothenburg go to Trip 2008 and more on the town in page on Country Info Germany. Note the town of Rothenburg is traffic free but there is ample car parking outside each of the five gates to the town. On the Romantiche Strasse at Camping Frankenhohe, at Schillingsfurst the site is situated just off the Romantische Strass in a Nature Park. ACSI Camping Card taken at 17 Euro's per night. The website for this site is here The Owners are very friendly and helpful. The Site itself is very clean. neat and tidy with lawned grass. There are 3 separate areas for Touring Caravans and Motor Homes with water and electricity nearby. The Toilets and Showers are 5* heated and spotless. The Laundry Room is situated in a second Toilet Block at the top of the site.Charge is 2.40 Euro's a load. White rolls are 30 cents each which you order and collect from reception. WiFi is excellent over 80% of the campsite by Hotsplots charges as below buy at the Reception. Bodensee at Camping Salem, ACSI CC at 17 Euro's situated in a valley at the back of the Bodensee. A well used site with good facilities and friendly Reception. Quite a few on here come back for weeks every year. Very popular with the Dutch, German and even a Brit Couple been here 5 years running. Below view sitting in the restaurant outside the Reception. 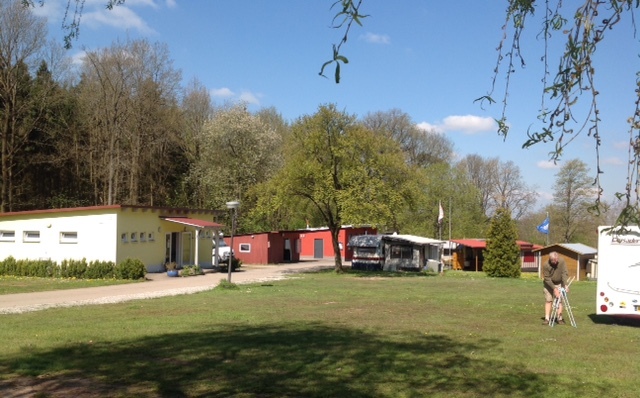 Campingplatz am Waldbad, Colditz. Website:- Here his was situated just outside the town and was very pleasant we found it in the Caravan Club Europe 2 Book. We had a wonderful tour of the famous Castle which I will never forget. More about this in our 2005 Trip Site 15. Can thoroughly recommend this site and the tour. To View Page 1 or 2 click Links below.